What does this mean? Do transposons make siRNA? I thought transposons were non-coding except when they travel via the retrotransposon mechanism. Do viruses that infect eukaryotic cells donate their own RNA genetic material for the cell to use in RNAi? But I thought RNAi was a cellular defence against viruses, how can viruses help give the dsRNA that’s supposed to fight the viruses? A number of sites online simply state that siRNA is exogenous is origin; do they mean that it comes from viruses? I would greatly appreciate it if someone could take the time to answer each of my questions one by one or even recommend a site that answers them all. Buchon N, Vaury C. 2006. 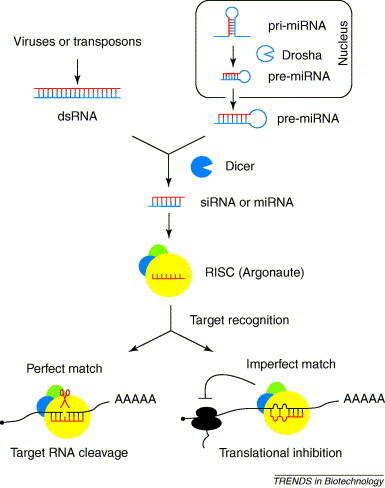 RNAi: a defensive RNA-silencing against viruses and transposable elements. Heredity 96:195-202.
van Rij RP, Andino R. 2006. The silent treatment: RNAi as a defense against virus infection in mammals. Trends Biotechnol 24:186-193. Not the answer you're looking for? Browse other questions tagged virology rna-interference or ask your own question.